The U.S. Geological Survey raised the alert level to red in Hawaii after the Kilauea Volcano sent a plume thousands of feet into the air Tuesday. The agency's Hawaiian Volcano Observatory issued the highest level alert in the afternoon after increased activity within Halemaumau crater. "Ash has been rising nearly continuously from the vent and drifting downwind to the southwest. Ashfall and vog (volcanic air pollution) has been reported in Pahala, about 18 miles downwind," HVO said. The burst in volcanic ash from Halemaumau Crater began at about 7 a.m. The National Weather Service said northeast winds were expected to carry the ash downstream across the Big Island Kau district, affecting the communities of Punaluu, Wood Valley and Naalehu into the early afternoon. Radar indicated the ash cloud reached up to 10,000 to 12,000 feet above sea level. The NWS warned people to avoid exposure to the ash because it causes eye and respiratory irritation. The HVO said most of the activity from Kilauea was centered at fissure 17, where lava was flowing about 20 yards per hour. As of Tuesday morning, the flow was about 1.2 miles from Highway 137. "At any time, activity may become more explosive, increasing the intensity of ash production and producing ballistic projectiles near the vent," the observatory said. Hawai'i County Civil Defense said no homes or roads were under threat. Meanwhile, a 20th fissure opened Tuesday morning near fissure 19 in the Lanipuna Gardens subdivision. HVO warned the eruption was still evolving and new outbreaks could occur both uprift and downrift of existing fissures. 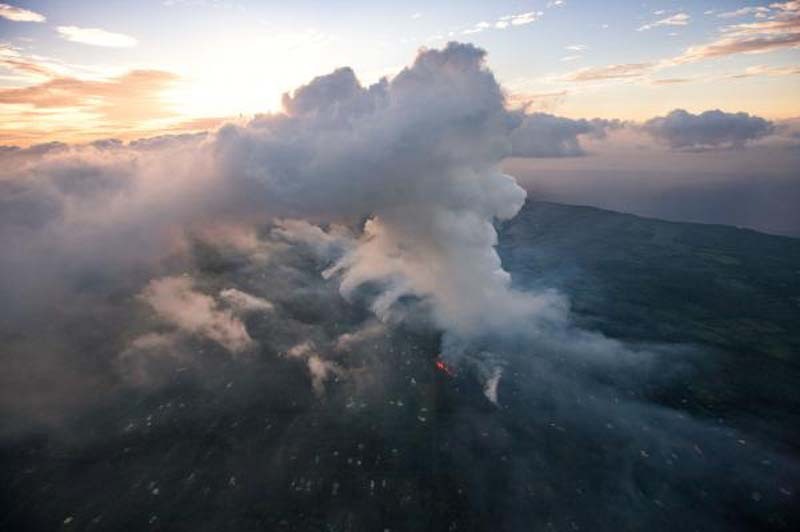 "Communities downslope of these fissures could be at risk from lava inundation," the observatory said. Civil defense said the Hawaii Department of Transportation was opening Highway 130 for local traffic, with metal plates covering cracks in the roadway. The agency also warned residents of Lower Puna to be alert to gas emissions.